We interviewed Mauno Hermunen about his return to Supermoto with a SWM Factory ride. 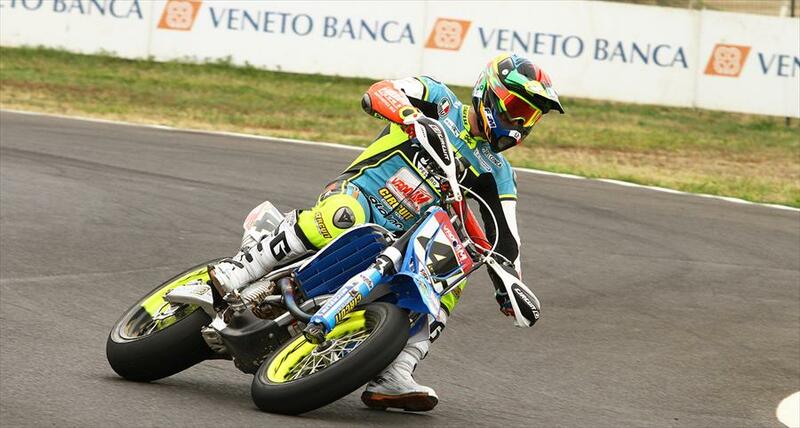 Italian Championship leader Teo MONTICELLI (Yamaha Aldebaran) was not riding due to injury during testing. The overall winner of the day was the World Champion Thomas Chareyre (TM Factory). In second place Marc Reiner-Schmidt (SWM Team BRT) who grabbed the podium thanks to two excellent overtakings ona tough Pavel Kejmar (TM - Degasoline). 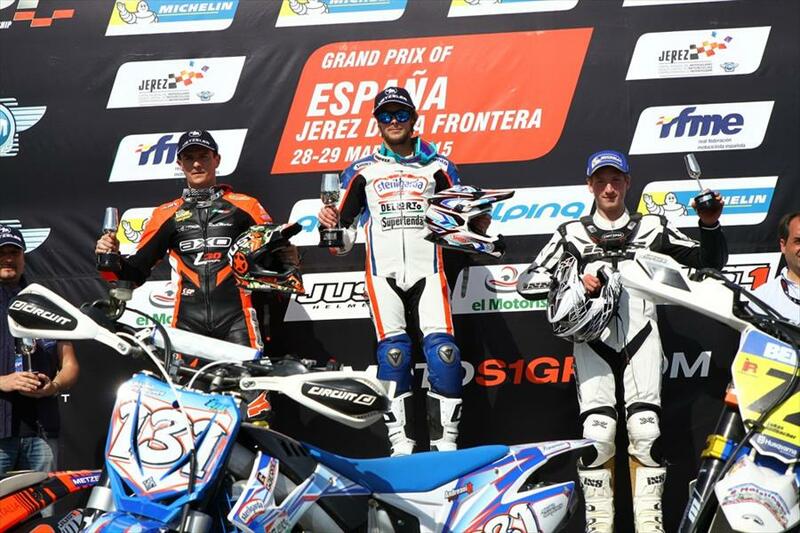 In fourth place finishes Edgardo Borella (SWM Team BRT) and German Markus Class(Husqvarna) closes the Top5. Marc Reiner-Schmidt grabs the Red Plate with 84 points, followed by Andrea Occhini(Honda Red Moto L30 Racing) with 65pt., he didn't have a good result due to severe back pain, with the same points ( 65), but in the third position, is SWM rider Edgardo Borella. Supermoto legend Mauno Hermunen will not be riding Supermoto this year. He is returning to his Motocross roots. For 2016 he will be riding the Finnish MX Championship aboard a Kytonen Motorsport Husqvarna. We wish Mauno good luck with his Motocross career and we hope he will return to Supermoto in the future! 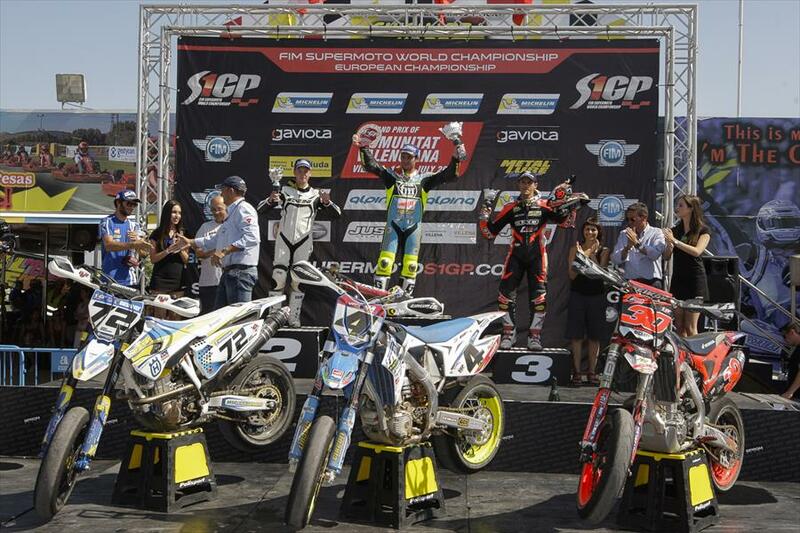 He will be missed in the Supermoto World. Under blue skies and temperatures in the high thirties the GP of Comunitat Valenciana will go down as a memorable one as Thomas Charyere regained the World Championship lead in S1GP, Marc-Reiner Schmidt was crowned S2 European Champion, and David Gimenez giving his fans a performance to be proud of in S2. Heavy rain on Saturday evening followed by rain on Sunday meant the circuit had to be modified without the use if the off road section, but it didn't do anything to dampen the spirits of S1GP Championship leader Mauno Hermunen as he extended his points lead with an emphatic double race win here today. In S2 it was almost business as usual for Marc-Reiner Schmidt as took overall victory with a 2-1 scorecard. Thomas Chareyre bounce back from his disappointment of the season opener to take control at the top of the S1GP standings with an emphatic display of riding here at Ottobiano today to not only win the GP but also take control of the World Championship as Marc Reiner Schmidt one again rode immaculately in S2 to extend his lead in the European Championship. The Bresse circuit hosted the first round of the Championship of France Supermoto Prestige, S2 and the Luc1 Cup, the new Honda cup class. An impressive 173 riders entered in these categories. Thomas Chareyre had an almost perfect weekend. In the last minute, the triple World Champion suffered a blown engine in the last lap of the second race. This cost him the podium after he scored the pole position and the win in race 1. So it's Sylvain Bidart who wins this first round with a second place in race 1 and then a victory in the second race. Waren Bougard finished on the second step of the podium after a third place in the qualifying, a third place finish in the first and second place in the second race. Luc1 Honda rider Laurent Fath from New Caledonia, newcomer to the discipline, was impressive in his first French Supermoto round and surprised everyone by finishing third overall with a fifth place in race 1 and a third position in race 2. Definately a talent to watch out for in the future. Sylvain Bidart: "This weekend is positive even though Thomas was stronger today. The organization of the event was a success and I have a lot of fun riding on this circuit. It was exciting to be able to fight in the first minutes of each race with Thomas even if in the end it he does not have any luck breaking the engine in the last round of the second race. But that's racing! Anyway the season looks very interesting." The AMA Supermoto National Championship had their 2015 season opener over the weekend at the Historic Adams Motorsports Park. The hype going into the race was the stacked Pro Open field, 2014 AMA Supermoto Champion Gage McAllister would have new additional competition. Riders like three time AMA National Champion Micky Dymond, 2008 National Champion Steve Drew, and S3 World Champion Alexis Marie-Luce all joined the series for 2015 and put up a fight. McAllister commented on the competition "I'm excited to have more guys racing the series this year, it should be a lot of fun". It was Dustin Hoffman getting the Virus International holeshot award, but he made a mistake on lap one and fell back to 24th. Hoffman would charge back to a top five finish and log the fastest lap of the day in the process. Gage McAllister inherited the lead and would not look back, leading every lap of the twenty-minute main event. Micky Dymond and Steve Drew would also finish on the podium. Monte Frank had a notable race finishing 4th. Fifteen year old Nicky Reimer held of Eric Stump in the Pro Lites class taking his second career Pro Lites victory. A four way battle in the National Amateur class lasted until the closing laps, Steve Alkyer will have the red plate at round two. Rocco Landers won the Mini Class. On a hot but windy day here in southern Spain and with the grandstands packed to the rafters the 100th Grand Prix of the FIM Supermoto World Championship burst into life with the best supermoto riders in the world preparing to do battle. And the opening GP on this historic occasion did not disappoint as close racing and fierce rivalries were once again the order of the day.